Here you'll meet some of our female mice. "Chan" is our most outgoing mousey, very much the little sticky beak always with her nose in something. If someone ventures a little too far out at feeding time it's always her. "Chan" is a Texel greyroan mismarked bi-colour. She was our first mouse to have both Texel parents, and was kept as one of our foundation stock for our Texel line. Even though she is only one generation pure, she has an exceptional texel coat, and rather than losing coat quality with age, as a lot of texels do, "Chan's" coat has improved with age. "Chan" has not been shown as yet. Even though "Chan" is now desexed, she has been a mum 4 times. Her first litter, of 8, was to "Carawatha Bolero", a champagne bi-colour, Of which we initially kept one male, a grey roan bi-colour Astrex (Carawatha Stallone) He was re-homed before we went overseas. Her second and third litters were to "Carawatha Houdini" a Self Seal Astrex. She had 8 and 2 respectively. Her fourth and final litter brought her some complications. She had the first mouseling with no problems, at nearly 11pm on a Friday night. However by the following morning she had not had any more, and the little one she had died overnight. We took her to the vet that day. Over the next 24 hours she passed 5 more babies, but all were dead. The vet examined these babies and they all looked normal, cause of death being that they'd been inside for too long. The next day came and "Chan's" tummy still felt like there was something in there, so it was back to the vet for exploratory surgery. The bump inside her turned out to be a set of Siamese twins. This being the reason she was having birthing difficulties in the first place. The Siamese twins were somewhat deformed. It was decided to give "Chan" an ovariohysterectomy. "Chan" recovered with a course of antibiotics and lots of TLC. Now over a month later she is back to her normal outgoing self and healthy as ever. So we are now the relieved owners of a rare little spayed girl, an unusual thing in the mouse world. Little "Thommie" was named because of her facial resemblance to the children's book character Tommy Brock. She is a Black Blaze Berkshire Texel. "Thommie" is a real character. Rather shy, but very curious too, and more often than not her curiosity gets the better of her shyness, and she comes right on out to see you, or the treat you might have for her, only to realise what she's done, and go bolting back into her home again. "Thommie" has not been shown as yet. "Thommie" is currently nursing her first litter to "Carawatha Ted'E'Bear". She has 8 roly little female texel babies. All are black, indicating to us that it's likely she doesn't carry the genes for pink-eye dilution. We have decided to keep one of her baby girls, a little Blaze banded, who we've christened "Samantha Whiskers". 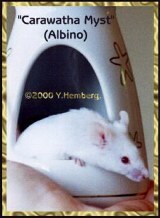 "Myst" is from our inbred strain of albino mice. She is what would be referred to as a recessive albino. (aacc). Her 5 generation pedigree is all albino's like her. In her background way back, there are some Siamese, chocolate & longhair. "Myst" is a quiet easy-going little mouse, who really loves her food, hence she is rather rotund, a trait not observed in this line before now and one we will be paying close attention to when it comes time to breed her. "Myst" has not been shown as yet. "Myst" has not been bred as yet. "Panda" is an overmarked banded black Texel. 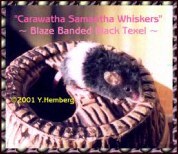 She is the result of mating two banded pattern mice together consistently, which causes them to be overbanded. "Panda" is a quiet little mouse who prefers to remain behind the scenes as it were. If there's someone unaccounted for on cleaning day, it'll be her, hiding somewhere, curled up asleep. She doesn't usually come out to you, but once she is out, she's friendly and quite comfortable to consume any treats you're offering. "Pandy" has not been shown as yet. 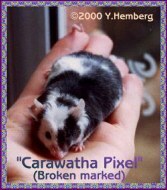 Panda had a litter (of 4) in December 2000, to "Carawatha Kingsford". (Our Silver banded boy). We kept one of her daughters, a lovely silver Banded Longhair, named "Taylor". "Drue" is one of our Special girls. She's easy-going and is often the peacemaker among our clan, if the need arises. She's a lovely silver argente mouse, who has her band & ticking visible, thus actually looking like an agouti variety mouse. An unusual quality for any argente mouse, as argente's usually have such a small ticked section to the coat, that they generally look two tone instead. In the beginning we thought she was a self silver with a frosty look, which we took as being poor coat colour. However after she gave us agouti's in her first litter where it couldn't have come from the male, we realised she was an argente. 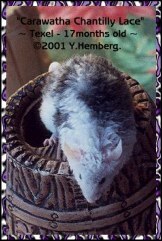 "Drue" has been shown once, in October of 2000, where she received 1st in her breed class and went on to get reserve agouti mouse of show. "Drue" has had one litter of 4 in October, to a cheeky little Balinese(baby) boy. "Carawatha Robin Goodfellow", who decided to leave his mark, by sneaking into the girls cage without us realising it, until 3 weeks later of course. 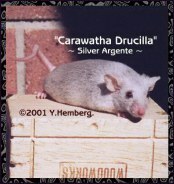 This exquisite Silver argente girl is the daughter of "Carawatha Iceman" & "Carawatha Vesper". "Iceman" was our first male of this colour & "Vesper", our first cream argente. Like her parents she has an exceptional temperament, being super friendly to both people and other mice. Vera's mousinality has meant that she is one of our group of special girls. This group of girls are our good Samaritans, taking in orphans, and older mice that need special attention. They've brought many mice, both young and old, through hard times with their special brand of affection, they're truly amazing. Vera is a very gentle soul, and we are hoping to breed from her soon, and to keep one or more of her babies. Vera was shown as a baby in October, where she placed first in her section. Vera is at present, our latest lady to be placed with a male for breeding. This gorgeous girl has the nickname Java. 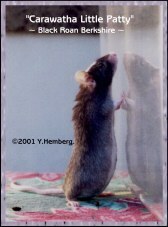 She was the first Javanese mouse we bred. Because Javanese (like Burmese) is a shaded variety, colour is often hard to pick. We believe her to be of the colour Otter. (a "ce" gene based colour). "Java" is the eternal mother, always willing to jump in to look after somemouse else's brood, even when she has no babies of her own. She even goes so far as to suckle them, even though she has no milk. For this reason, we sometimes put her in with "first-time mums" as a kind of midwife to help them along. She is one of our only mice who is "kissy" like a rat. "Java" was shown once in October 2000. Even though she got first in her breed class, she was the only one in the class and didn't qualify for her challenge. We plan on showing her again if we get the chance. 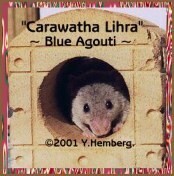 "Java" has had one litter of 9 in December 2000 to self blue boy "Carawatha Dinero". It was this mating that proved to us that Java is not lilac in colour. If we breed her again it will be to our Burmese boy "Carawatha Santana". "Lihra" is our oldest lady, a lovely blue agouti. In spite of her age and just recently, her frailty, she still rules the roost as alpha mouse. She's very people orientated. I'm sure she thinks she's more person than mouse. She is always at the door to greet you. "Lihra" has never been shown. "Lihra" has given birth to two litters, both to our first bred blue self boy "Carawatha Yenom". Her first litter of 6, had 1 blue agouti like herself and 5 self blues, of which one female went to Pipsqueeks mousery and one male "Carawatha Dinero" we kept, who was later re-homed before we left for overseas. Her second litter, so she tells us, was for quality rather than quantity, having one very large squishy blue agouti male. "Lihra" is a retired senior citizen now and won't be bred from again. Our little "Taylor" is a bit of a daredevil. We're not sure if it's intentional or just because she's a bit overweight, causing her to overbalance, falling off things. But she's the one who invariably ends up somewhere where we can't work out how she got there. She sure is good entertainment value, even though it is a bit of a worry sometimes. Taylor is a Longhaired Banded silver. She has the cutest little face, that just looks too small for the rest of her. "Taylor" has not been shown as yet. We plan on breeding "Taylor" within the next few months. "Little patty" just might end up with her name shortened to just Patty, as she's anything but little anymore. She is a lovely black roan Berkshire. "Patty" is the result of an outcross to our berkshire lines. We obtained her father, "Harrington's Sebastian" a lovely blue roan berkshire, to add diversity to our berkshire line. "Sebastian" has since been re-homed back to Harrington's prior to us going overseas. "Patty" is a very active mouse in spite of her size. She's usually the first one to rough up any newcomers to the clan, including any that have merely been away for a little while. We're expecting that "Patty" will take over as alpha mouse when "Lihra" decides to give up her post. "Patty" has not been shown as yet. "Patty" will be in line to keep our Berkshire lines going in the not too distant future. "Alanis" is a seal point Siamese coming through our Balinese lines, which stem from our original Siamese line started back in 1994 when we started breeding mice. She is a sturdy little powerhouse of a mouse. If somemouse is up at a strange time going hell-for-leather on the wheel, guaranteed it'll be her, we're sure she's an aerobic junkie, just addicted to those endorphins. At least we know she'll be in tip top shape when it comes time for her to think about a family. "Alanis" is yet to be shown, we expect she should do well. "Alanis" has not been bred from as yet. Little "Willow" is an exquisite looking golden agouti. She carries Sphynx, which is why we obtained her from Harrington's mousery to be an unrelated outcross in our Sphynx lines. However due to some health problems with the majority of Sphynx mice in Australia, the initial lines we'd planned on breeding her with did not eventuate. "Willow" is a very friendly clan member. Because she is one of the youngest she seems to be happy to go along with whatever the majority of the group are doing, so no 'big spoon' awards for her just yet. "Willow" has not been shown as yet. When it comes time to breed her we may trying to breed a stronger line of Sphynx mice, but are unsure of this as yet. "Selene" started out as a lovely beige burmese, however her points are fading with age, and she almost looks like a self now. Selene is the quietest of our group and quite timid. She is easy to handle once you do catch up with her though, I guess I'd have to say that she has a rather benign personality, doesn't make herself known. She is one of the reasons we do a head count after playtime, just to make sure no-one's left out. "Selene" was shown in October 2000. She took out first in her breed class, earning her challenge and going on to get reserve shaded mouse of show. Due to her fading points we will likely not show her again. "Selene" has mothered one litter of 8 in December 2000 to self blue male, "Carawatha Dinero". She is in line for one more litter before we retire her, and will most likely be mated to our Burmese boy "Carawatha Santana". "Pixie" is a broken marked black roan. She is "Simba's" sister. We kept her and her brother to delve more deeply into a rather odd phenomenon which appears to occur in their line. "Pixel's" mother "Carawatha Wisteria" has had three litters, and each time the babies loose fur around their whisker pads and nose area at around 3 weeks of age and it doesn't return until around 3months of age. At first we thought that the mother was barbering her babies in this area, as we fostered an unrelated baby onto "Wisteria" and this baby was observed missing fur too, so we thought we had it sussed. However we decided to house "Wisteria" with another mum-to-be (C.Blanca) for her last litter. When the babies were two weeks old we took "Wisteria" and one of her babies away, to see if her other two would develop the hairless muzzles. Sure enough at nearly 3 weeks of age they both lost their muzzle fur as did the baby who remained with "Wisteria". None of "Blanca's" young lost any fur at all. Their fur & whiskers grew back a bit before they were 2 months old in this case. So we decided to keep a pair from this litter to see what we can find out. Now adults, "Simba" looks normal, but "Pixel" doesn't have any whiskers to speak of and her whisker pads look a bit pink, like the fur there is pretty sparse too, so there is definitely something unusual here. Pixel is one of our youngest mice, and is still a little shy, but is very easy to handle. "Pixel" has not been shown. Her lack of whiskers really makes it a tough one, as to whether we would even be able to show her, maybe some pet classes. If we can prove in the future, that the lack of whiskers is a new variety, then maybe standardisation would be possible. "Pixel" is in for breeding with "Simba" at present. "Rani" is an exquisite dove tiger lady. She's rather reserved in her affections, both towards us and other mice. She loves her wheel, and her food, and seems to be pretty happy with her lot in life. We plan to try her on the showbench, she is a little undermarked, and could have more barring, especially on her face. We would like to breed from her some time in the future. "Little Ashah" is an adorable baby blue roan marked girl. In marking she is akin to a blaze/cardigan, if that were a type of fancy mouse. She is an overmarked version of her sister. "Ashah" is a gentle little mouse, very inquisitive. Her pic at left is a good shot of her, always moving, always with her nose in something. If we show her it will be in the pet classes, she is a super friendly little mouse. We're unsure of whether we will breed with her as yet. 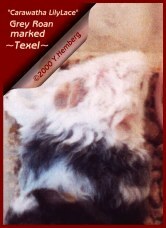 If we do it would probably be in our texel or manx line, where pattern is not important to showing. "Hannah" is a lovely blue roan berkshire. She is of the same personality as her sister Ashah, very calm and friendly. We plan on showing Hannah in the future. We look forward to introducing Hannah's line to our own berkshire line in the future. & now for our newest additions - 2 little babies from Thommies' litter. Little "Sammie" is a baby blaze banded black texel, from "Thomasena's" current litter. She already has extremely long curled whiskers and that lovely permed look to her coat. Her and her 7 sisters are handled daily, and are already quite calm as they enter into their "flea" stage. We'll keep you updated on how she goes. So long as "Sammie's" coat is of show quality, we plan to show her. Even though texels can be shown in any standardised or unstandardised coat pattern, her markings are quite good too which will be a bonus on the show bench. Irrelevant at this stage, we're not sure whether we'll be breeding from her or not. Little "Sammie" is a baby grey roan & white marked texel, with similar patterning to our "Chan". She basically has an all white face and head, but has pigmented patches, almost like thumbprints, on both her ears. She is a lot more adventurous than her sister Sammie, very outgoing. Incidentally she was the biggest in the litter, and still is. We'll update her pic with a better one shortly. It's fortunate that Texels can be shown in unstandardised patterns, because Lily doesn't fall into any category of marking really. She's very attractive with her earmarks. We plan on showing her if her coat turns out as well as we expect it to.